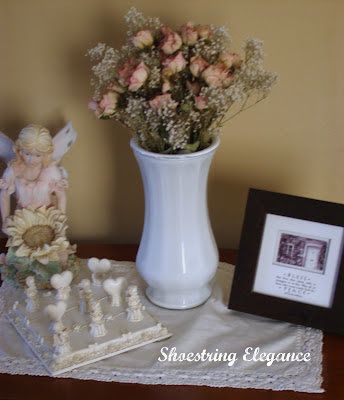 Shoestring Elegance: My Version of an Old Classic Vase!! Hi all!!! Okay, so I have seen a lot of people making their own milk glass or just spray painting colors on glass vases, lately. 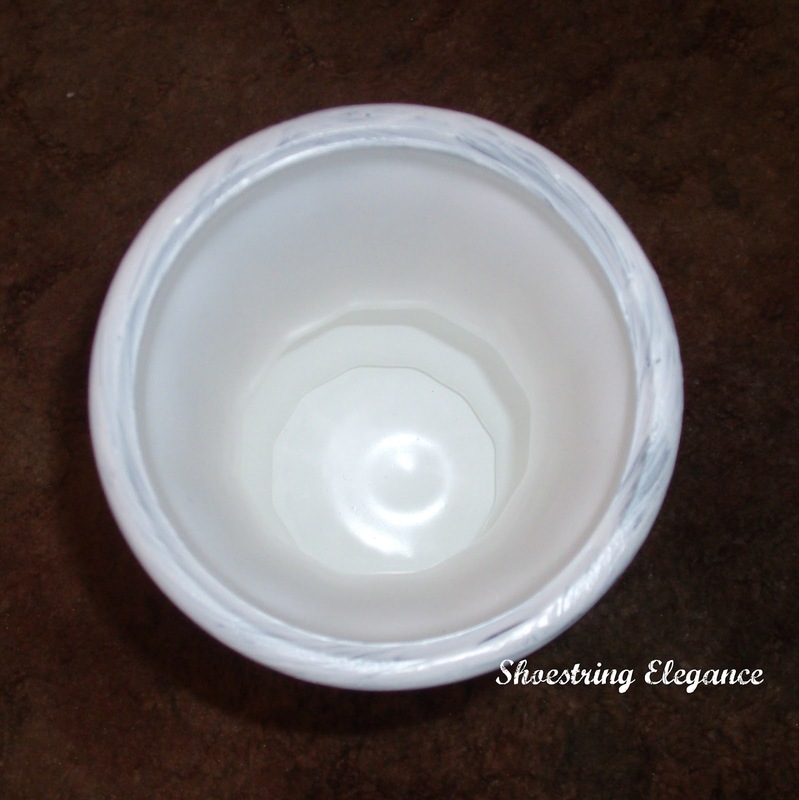 While it is nice, I remember knowing that the milk glass vases were glass and I had been wanting to try something for a while... So, I decided to test my theory…(while I love all the other vase projects I had seen) I wanted to see if I could do it the way I was thinking. I got this vase at our local Hospice Thrift store for $1.25. I got some exterior acrylic waterproof white paint. I remember my Grandmother’s kind of looked like the “milk” part was actually in the glass. So, I used about 5 oz. 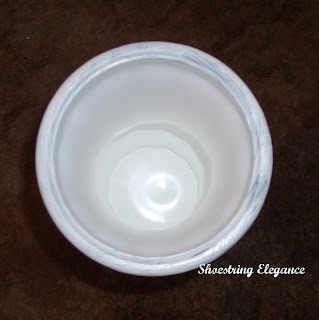 of paint squirted in the bottom of the vase and then very slowly twisted and turned the vase so that the entire inside was completely coated in paint! It was exciting and kind of boring, if I'm being honest, I had to turn it for about 35-40 mins. Then turn it upside down to let the excess drip out. I didn’t want to have to redo this process so I let it sit in a sunny window for the next 3 days…that paint was dry! I still wasn’t sure if I could really put water in it and have it stay the same, but I couldn’t wait to see it. So first I tried it with a beautiful bouquet of dried roses I had. Then, the time came, I filled the vase 1/2 way and let it sit there for three days...It held!! The paint was unaffected! Woohoo! It had worked! So I ran to the store the next morning and got these lovely blooms to put in it…Day 3 there still looking Lovely!! Just my version on an old look, but I really do like it! Many Blessing to you all today and every day and Thank you so much for stopping by to visit my little blog. I love it too!Thank you so much for sharing it with us at the "Sunday Stop"!!! I am going to have to try it!!! Make sure you are very specific about the paint you use they will not all work, I've had a failure prior to this time! Oh I love that the paint stays even when wet! I will be following your directions to a T on some vases I have! 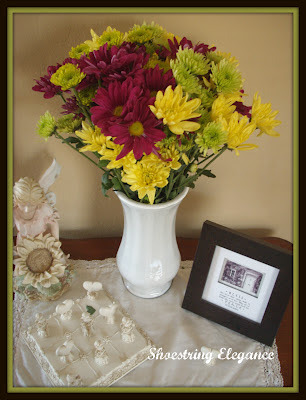 I'd love it if you shared this at my party going on now at www.kathewithane.com! to your blog, thanks for the invite! What a great job - and thanks for your advice - I too wondered if it would be waterproof! Thanks to you both, Kathy and Karima!! Be very specific anout which paint you use, as I said above it didn't work right the first kind I used! So creative! And turned out lovely! THIS IS GORGEOUS! You KNOW I'm gonna have to try - who would ever know it's not real milk glass?! Thanks for sharing at my linky party... as always, very impressive! God Bless you, Heather! You are always so kind to me. I'm glad you liked it though, Have fun with it! I love the look of just plain white, it seems so much cleaner and finished than the clear. Great job! Thanks for sharing and I am a new follower! Hi there! I'm visiting from All Star Block Party. This is a great idea. 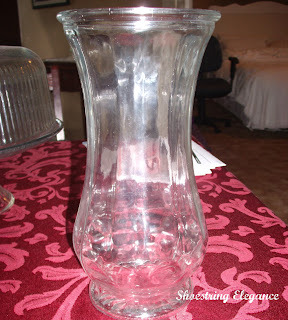 I have some cheap vases that I received with flowers. This would be a great way to spruce them up an make them more interesting. Plain white is go classy!! Thanks for the idea! I am now a new follower and would be honored if you would visit and follow me back at http://lifeofblocks.blogspot.com/ Thanks! I just picked up a little piece at the thrift store. I was so excited. Your collection is wonderful. Love how you can make it work with any decor or season. Great job. I never would have thought that the paint would stay with water in it. Love it! Thanks for sharing at the All Star Block Party. Looks great! Thanks for sharing at Etcetorize! It may have taken a bit of time but really the result is stunning. Nicely done. Thanks for sharing your frugal but fantastic creation on BeColorful this week. Thanks, P! Yes, I,too, think it was worth the time! Great project! There are so many glass vases out there and for some reason I never thought about painting them...love how your vase turned out! Thanks for sharing at Sunday Blog Love! Sandy, That's exactly what this was..The Floral vases wotk great! They are just the right thickness, I think. So glad you liked it! Isn't it great when an idea floating around in your head works out so well! Looks good! Thanks so much for sharing on Busy Monday at A Pinch of Joy. Hope to see you again soon! You are being featured tomorrow! Yay :) Can't wait to see that you share with us this week! Bj, You are so kind to me!! I am so pleased that you enjoyed this as much as I did!!! Thank you so much for your kind words and positive affirmations for me, that I'm doing what I am supposed to be...Can't wait until tomorrow!! So Excited and proud to be able to display your Feature button here!! Thank you so much, Kathryn!! So glad you liked it! Share it when you do yours, please!! Thanks for being a wonderful Hostess over @ The Dedicated House!!! Well, it looks like you have a winning idea here! Glad your experiment was so positive! 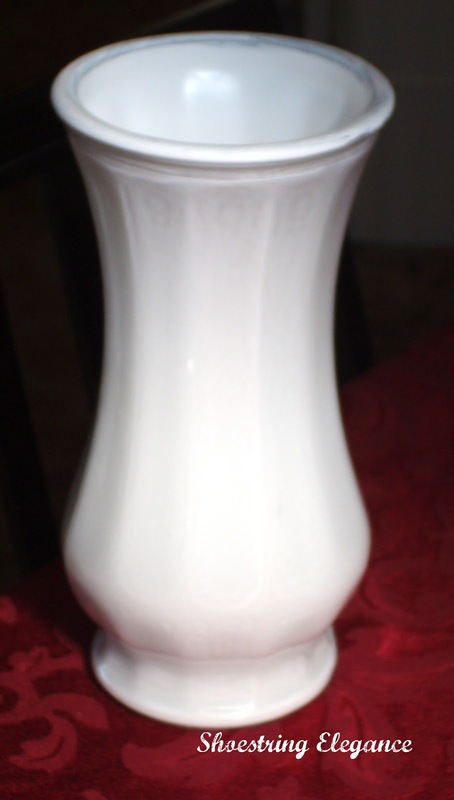 I love milkglass, and it is getting harder to find. I love this idea. Thanks for sharing. I love the after and that it can be used with water. So many other versions don't work that way. Thanks so much for sharing on Tout It Tuesday! Hope to see you tomorrow.